Sign-up to donate items here. Six years ago, a Karen couple came to the United States after spending their childhood in the Thailand refugee camps. The mother, now 23 years old, remembers nothing of her home country of Burma, as her family fled to the camps when she was only one year old. The only childhood she remembers is one spent as a refugee, trapped in a camp where the only hope was one day being resettled to another country. Her husband, now 33 years old, found his passion for teaching while living in the camps, where he taught young students how to read and write the Karen language – lest they forget their culture and country. They got married after being resettled in the United States and moved from Georgia to Nebraska, to be closer to the strong Karen community in Omaha. Two years ago, they gave birth to their first child, a beautiful little boy. Then, earlier this year, they found out that they were pregnant with their second child, a little girl who’s due date is at the end of August. Since arriving in the United States, life has been challenging for the couple, and they have struggled to adjust to their new life. The mother was only educated to 10th grade and her greatest desire in life is to go back to school and complete her education. The father works full-time as a meat packer in a factory, a far cry from his passion towards education. The daily drudge of a monotonous job that he cannot stand, but must work for his family, has taken a toll on his mental well-being. He desperately wants to get back to teaching, but his English is not proficient for him to go to college to get his education degree. While out installing air conditioning units this summer, Restoring Dignity happened upon this family’s home and immediately saw that they needed assistance, particularly with being taught how to clean and organize a home. There was a sense of hopelessness in the house, a feeling that things will not look up and that circumstances will stay the same. After spending time with the family and talking with them, we discussed the opportunity of Restoring Dignity volunteers helping to make their apartment feel more like a “home.” They were very receptive to this and invited us to help them. On Saturday, August 25th, Restoring Dignity will provide this family with much-needed household items, and will teach cleaning and organizational skills. Join us by donating items or by volunteering! We are taking action on Saturday, August 25th, 2018 from 10am-4pm, to provide this family with much-needed household, cleaning and organizational items. Come join us as we bring hope and encouragement to them! Please sign-up for items you will donate on our donation sign-up page. There are two ways to drop-off items: (1) At our new storage unit, or (2) on the day of the project at the family’s home. If you plan on dropping off donations at the family’s home, please contact us for their address, and plan on having all items dropped off between 10am-11am, the day of the project. 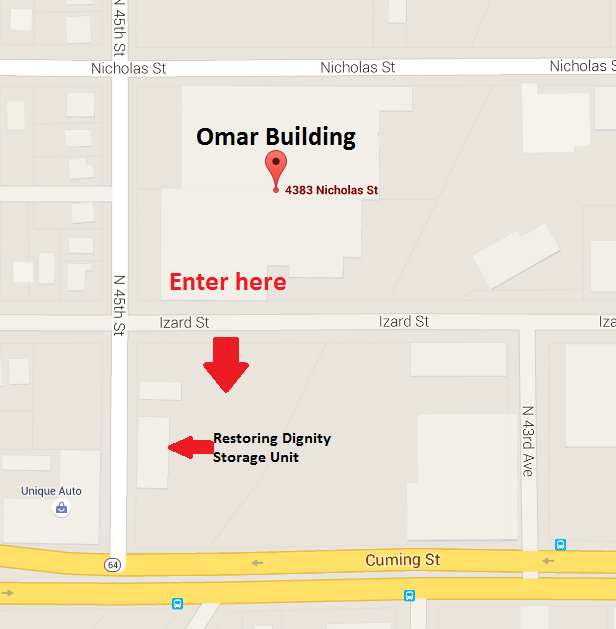 The Restoring Dignity storage unit is located in the garages behind the Omar Baking Building (4383 Nicholas St. Omaha, NE, 68131–the storage unit is in a fenced-in lot on the corner of 45th and Izard street. Please sign-up to volunteer via our sign-up page. Pre-Shift: 11:00am-1:00pm, at the Restoring Dignity Storage Unit: This shift involves getting donations ready for the project date. At the Restoring Dignity Storage Unit. Transportation: 8am-10am: This shift involves loading items onto trucks at the storage unit, and unloading them at the family’s home. We will provide a U-Haul truck. Shift one: 10am-12pm: This shift is for people who want to help with cleaning, organizing clothes, steaming and fixing items. Shift two: 12pm-2pm: This shift is for people who want to help with cleaning, organizing clothes, steaming and building items. Shift three: 2pm-4pm: This shift is for those who can help move furniture into the apartment, build and decorate. Half Day: 10am-2pm: This shift is for someone who would like to have a Restoring Dignity immersion and/or be a project leader. Half Day: 12pm-4pm: This shift is for someone who would like to have a Restoring Dignity immersion and/or be a project leader. Full Day: 10am-4pm: This shift is for someone who is looking for a full-immersion with Restoring Dignity and/or wants to be a project leader. Handyperson shifts: This shift is for a person who is skilled with tools, can help fix broken items in the home, can assemble beds and other furniture, and can hang pictures. Sign up for shifts can be found at the Restoring Dignity Sign-Up Page. We could not do these projects without our donors! They are the heart of these projects! Please let us know what you can donate, and we will take the items off of the list above. If someone would like to “adopt” a member of this family or a room in the apartment, by fulfilling the donations needed for that area, let us know. Otherwise, if you have any items in your house that you no longer need or use, please consider donating them to these projects. Your donations truly do make a direct impact on families in need. To donate items to this family, visit our donation sign up page. For this project, we need a minimum of 35 volunteers spaced out over the course of four hours. Our volunteers will decorate, hang pictures, lay down rugs, and install window air conditioners. The more volunteers, the faster we can accomplish our goal. We would love to have you join our team! Please visit our Restoring Dignity Sign-Up Page to add yourself to one of our two-hour shifts. As Restoring Dignity has grown so have our basic operating expenses. We now have our own storage facility where we accept, sort and store all of our donations. We pay monthly rent and utilities and are dependent on the financial contributions that we receive. If you are interested in making a financial contribution, please click here. Did you know that hundreds of refugee families are resettled in Omaha every year? If each of them had an American family who could provide mentorship for at least one year, many of the issues that Restoring Dignity steps in to help with could be avoided. If you are interested in mentoring a refugee family (including this one! ), contact Refugee Empowerment Center (formerly Southern Sudan Community Association), as they have a mentoring program that is in need of many American volunteers: http://refugeeempowerment.org/volunteer-opportunities/. Tell your friends and family about this project! They might have an extra lamp or a dresser that is no longer in use. Re-post this blog on your Facebook page, or email it to people you know. The more people that know about these projects, the more donations and volunteers. Restoring Dignity has a Facebook Group that is regularly updated. Please join our group: Restoring Dignity Omaha Facebook Group.